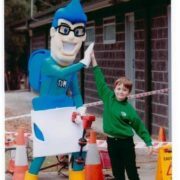 The Drain Man is proud to be assisting Eastwood Primary School with their troublesome drains. We were prompted to act by a story in the local Maroondah Leader newspaper detailing how the school’s 60 year old drains were so badly blocked the children couldn’t flush their toilets during the day but had to wait until the evening to ensure they didn’t overflow. The situation was so bad the school had paid to have plumbers come and try and unblock the drains several times over the last 6 months, using up desperately needed school funds and, getting no real result. When we heard of the situation, we immediately offered to visit the school to find and solve the problem for good, all with no charge to the school. We sent our cameras down the drains and immediately found the problems. Massive tree root growths were blocking the drains and in many places the old terracotta pipes were either cracked at the joints or had subsided causing anything that was flushed down the drains to catch on the broken edges and block the flow of water. The Drain Man currently has a team on-site working to clear the drains and will progressively reline the school’s drains over the next few weeks to provide a permanent solution for the school that is guaranteed for 40 years. On another positive note, the day the Drain Man team were on-site inspecting the drains, the State Education Minister visited to inform the school they were receiving million of overdue funding to help rebuild their school. 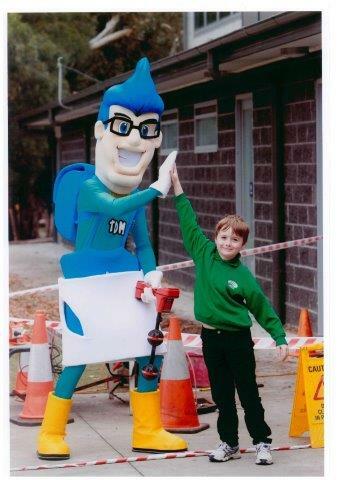 The Drain Man is proud to be providing this service with our compliments to a very worthy local school and very pleased that the school will not have to spend a cent of its new funding on their drains but can devote it all to building a better school for the kids.